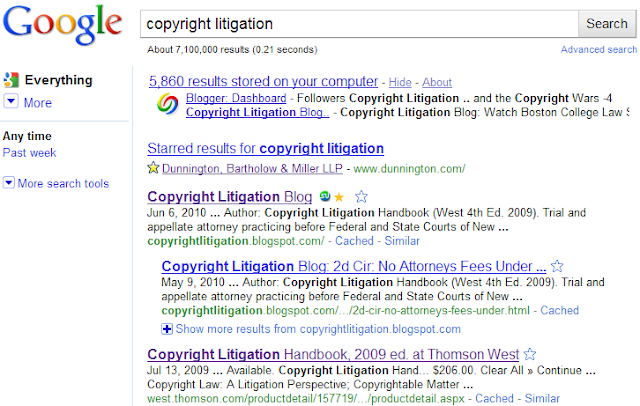 Search results from Google put Copyright Litigation Blog and Copyright Litigation Handbook at number one in search engine results for the search "copyright litigation". Thanks, Google, and thanks to everyone who enjoys the content, your readership, comments and feedback are all appreciated. Your content is always interesting and informative. You deserve to be #1! I will take the liberty to express some level of skepticism over your post, which seems to not take into account the fact that the Google search engine does not deliver the same results to everyone, but is skewed towards the particular user. For instance, when I searched "copyright litigation", and Google did not return the result pointing to your book, although you are still the first result. At any rate, congratulations for your blog, I have only recently discovered it, and find it offers an interesting view on copyright issues. Thanks, JC. I looked at the screenshot, the first two listings are "sponsored links". 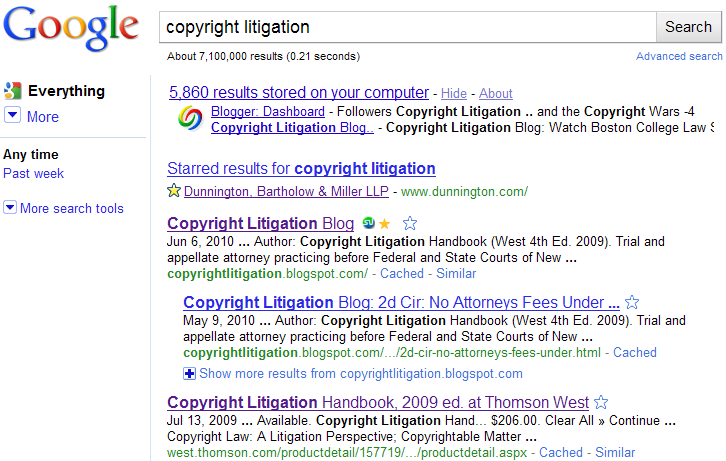 Copyright Litigation Blog is the first non-sponsored link in your Google search. I asked a few people I know to check from their machines and the blog came up #1, but it may be possible that it's not true everywhere. Beats the hell out of the very slanted 'Copyrights and Campaigns' blog. How to Digitalize Your Textbooks: Fair Use?